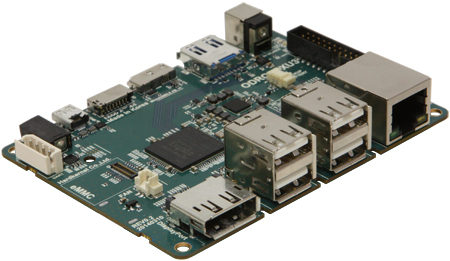 The ODROID-XU3 is powered by ARM big.LITTLE technology and comes with a Heterogeneous Multi-Processing (HMP) solution. The ODROID-XU3 is a new generation of computing devices with more powerful, more energy-efficient hardware and a smaller form factor. Offering open source support, the board can run various flavours of Linux, including the latest Ubuntu 14.04 and the Android 4.4. By adopting e-MMC 5.0 and USB 3.0 interfaces, the ODROID-XU3 boasts fast data transfer speeds, a feature that is increasingly required to support advanced processing power on ARM devices that allows users to fully experience an upgrade in computing such as faster booting, web browsing and 3D game experience. Don't need DisplayPort and energy monitoring? Then you should also have a look at the ODROID-XU3 Lite board.